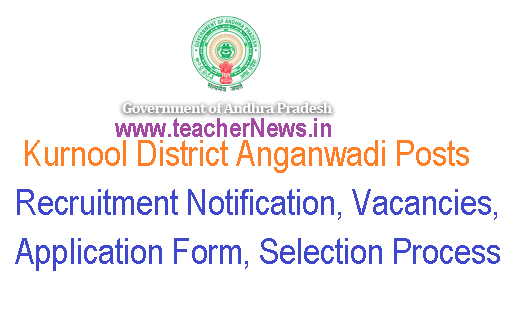 Kurnool District Anganwadi Posts 2018-19 Notification Vacancies Application Form Download : Kurnool District Anganwadi Posts 2018-19 Recruitment Notification, Worker Vacancies, Helper (Aya) Vacancies, Application Form, Eligibility Criteria, Selection Process and Apply last date at kurnool.ap.gov.in. Notification for Fill up of Post of Anganwadi Workers and Anganwadi Helpers 2018 Notification for Filling up of the Post of AWW, AWH, Mini AWW of Kurnool District. Vacancies of Anganwadi Workers and Anganwadi Helpers in Kurnool District notified. The Women and Children Development society has released the recruitment of huge number of candidates from Kurnool District in 2018 for the posts like teachers, helpers, supervisors, workers, etc. Amongst the Indian states who will get the opportunity of the recruitment, Kurnool District is one of them. For the aspiring candidates who want to apply for this state mass recruitment must be within the age limit of 21 to 35 years as on 01-07-2018. The candidates will be selected for the post via two stages that will decide the final merit list of the selection of Kurnool Anganwadi candidates 2018.
Who are eligible aspirants must download the AP Anganwadi Application Form from official site and submit your details in nearby CDPO before 26-11-2018. Kurnool District Anganwadi Posts 2018-19 Recruitment Notification, Worker Vacancies, Helper (Aya) Vacancies, Application Form, Eligibility Criteria, Selection Process and Apply last date at kurnool.ap.gov.in.